Giraffes are known and well identified by many people around the world, as they are present in many stories about animals, safaris, zoos and cartoons. Giraffes and elephants are among the most mentioned by children when they are asked to name animals. The presence of giraffes in the human culture has been outstanding, always represented as a kind, beautiful, elegant and peaceful animal, but at the same time powerful and able to defend itself when necessary. Due to the unique physical appearance of the giraffe, they have been part of the popular culture for a very long time. There are many cave paintings and illustrations of giraffes all over Africa from early civilization that often depicted giraffes in various drawings showing them in high regard. The heritage of this particular animal was found in that continent and continues to be the only place in the world that they still freely roam in the wild. Many found the giraffe to be a symbol of uniqueness. 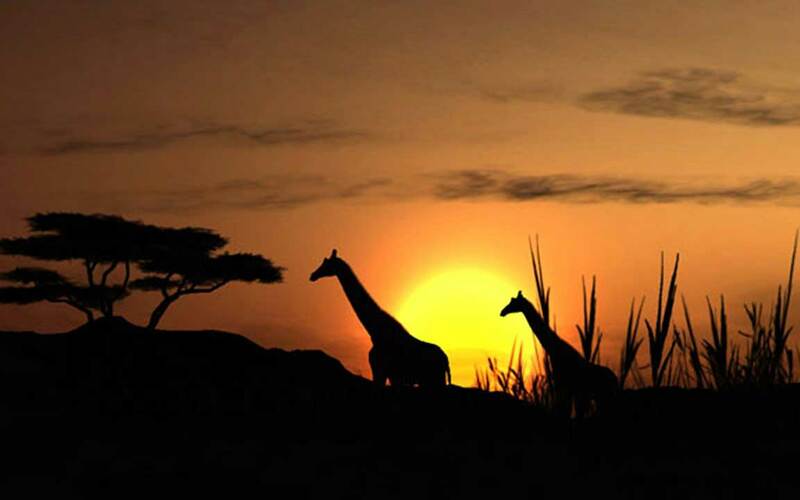 In fact, it is the African culture that has the most respect for the giraffes. They are the ones with the traditions and the links back to earlier days of when these animals were considered to be magically and also something that the people viewed as very different from those around them. One of the earliest recordings of this is a giraffe that was successfully transported from Africa to a zoo in China in the early 1400’s. Specifically, in 1414 a giraffe was taken to China along with precious stones and spices of great value; They named it Qilin. Qilin is part of Chinese, Korean and Japanese mythology and is represented by a beast with a mixture of characteristics of various animals such as fish, lion, deer, and even a dragon and means prosperity and serenity. They related it to the giraffe because it has certain elements in their appearance that refer them to the being of the mythology so important within their culture. There are many cave paintings and illustrations of giraffes all over Africa from early civilization. In the 19th century, Charles X of France was given a giraffe by the leaders of Egypt. He loved this animal, and it was a something he showed to his guests for 18 years. At that time the chance to see one in person was very limited, and so people felt this was a special honor. His palace featured many paintings of his beloved giraffe, and he often referred to it as one of the best gifts he had ever received. Many books, in particular for children, use the giraffe as the protagonist to make them feel good about themselves. It is common for children to feel uncomfortable if they are different from others. For example when a child doesn’t have uniform characteristics or is taller than others. The giraffe is the perfect animal to help them see that every creature out there is fantastic no matter the way they look. Giraffes, by Nicole Helget, is an educational book that explains the social behavior, physical characteristics, habitat, and distribution of giraffes, as well as the importance they have in human culture around the world. Also, it has beautiful photographs that make the reading enjoyable. The book Giraffe: Biology, Behavior, and Conservation of Anne Innis Dagg, a Canadian zoologist author of numerous works is also an excellent source of information. She has valuable information about giraffes and her passion for this animal has given her worldwide recognition. It is a 256-page book that also deals with the situation of giraffes in captivity. For younger people or children the short book titled Giraffes, by author Judith Jango-Cohen is an option. There are basic and brief explanations, with colorful typography, illustrations, and photographs to complement the texts. It is not a children’s book, but it is not a thorough work either. If you have small children, the National Geographic Little Kids book with giraffe-oriented editing is an excellent gift that will entertain your kids. It contains beautiful photographs and fascinating facts that with the help of adults they will enjoy. It’s a great way to start reading their first words while learning about giraffes. Turning to audio-visual materials, we have the 60-minute DVD created by the BBC entitled “Africa, Eye to Eye with the Unknown,” narrated by the renowned English naturalist Sir David Frederick Attenborough. It deals with the wildlife of Africa and shows the different ways in which living beings survive in a dangerous and challenging habitat. The giraffes have a prominent role in this documentary. Alex is an animated educational series aimed at preschoolers. They are short chapters but with many bright colors, fun music, friendly characters and educational teachings. It also has episodes where many other animals, both terrestrial and aquatic, are addressed. Not all TV shows are aggressive with the kids, Alex proves to be a big difference that parents love. Georgina the Giraffe is an animated character created by the BBC for the entertainment of the children. She lives with other friends who help her solve problems; Among them are a pair of monkeys, an elephant, a zebra, an ostrich and a hippopotamus. There is an online game called Giraffe Got Game. The concept is a bit strange, but some people admit to saying it’s fun and addictive. It is a giraffe with a gun built to the height of his chest that serves to shoot penguins, balloons, flying puppets, red cubes and even zombies who want to feed on it. Anyone with children is likely to know the fun-loving giraffe called Geoffrey as he is the mascot for the giant known as Toys R Us. He has a pleasant voice, and the toy store offers stories by him as well as stuffed giraffe toys that are huge sellers. Children can also be signed up to get a phone call from Geoffrey on their birthdays and around Christmas time if parents provide that information. Many advertisers like to use the giraffe too as a form of promoting their business. They know it is an animal that gets attention and that stands out as being unique. They want to offer that same thing to their customers. The giraffe has a good natural look that people don’t associate it with a wild animal. You will find that stuffed giraffes seem to have a prominent place in the hearts of children and they are great gifts for them. Playgro, B kids, Playskool, Fisher Price, Hasbro, among other brands of toys for preschoolers, have within their products, entertainment based on the image of giraffes. Because their concept represents protection and tranquility, they are the favorites for mothers when choosing a toy for their baby. It is common to see company logos with giraffe figures. Whether abstract, in caricature or with real elements, a corporate identity that carries a giraffe in its presentation, provokes confidence, dynamism, socialization and an air of coolness and originality. Look online for examples of logos with giraffes, and we are sure that you will like more than one. If you saw Madagascar the movie, you certainly enjoyed Melman, the giraffe. It is a reticulated male scary, hypochondriac and very romantic. He knows how to treat injured animals and how to be a good friend. It is a good recommendation for the whole family. Williams, E. (2011). Giraffe. Reaktion Books.